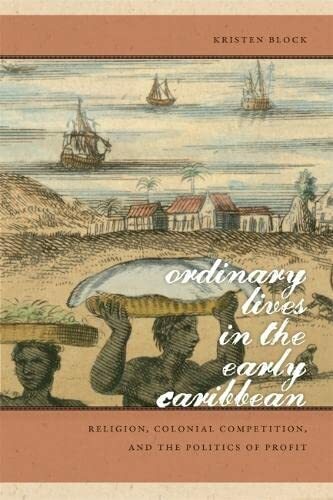 [PDF] Ordinary Lives in the Early Caribbean: Religion, Colonial Competition, and the Politics of Profit (Early American Places Ser.) | Free eBooks Download - EBOOKEE! Description: Kristen Block examines the entangled histories of Spain and England in the Caribbean during the long seventeenth century, focusing on colonialisms two main goals: the search for profit and the call to Christian dominance. Using the stories of ordinary people, Block illustrates how engaging with the powerful rhetoric and rituals of Christianity was central to survival. Isobel Criolla was a runaway slave in Cartagena who successfully lobbied the Spanish governor not to return her to an abusive mistress. Nicolas Burundel was a French Calvinist who served as henchman to the Spanish governor of Jamaica before his arrest by the Inquisition for heresy. Henry Whistler was an English sailor sent to the Caribbean under Oliver Cromwells plan for holy war against Catholic Spain. Yaff and Nell were slaves who served a Quaker plantation owner, Lewis Morris, in Barbados. Seen from their on-the-ground perspective, the development of modern capitalism, race, and Christianity emerges as a story of negotiation, contingency, humanity, and the quest for community. Ordinary Lives in the Early Caribbean works in both a comparative and an integrative Atlantic world frame, drawing on archival sources from Spain, England, Barbados, Colombia, and the United States. It pushes the boundaries of how historians read silences in the archive, asking difficult questions about how self-censorship, anxiety, and shame have shaped the historical record. The book also encourages readers to expand their concept of religious history beyond a focus on theology, ideals, and pious exemplars to examine the communal efforts of pirates, smugglers, slaves, and adventurers who together shaped the Caribbeans emerging moral economy. No comments for "[PDF] Ordinary Lives in the Early Caribbean: Religion, Colonial Competition, and the Politics of Profit (Early American Places Ser. )".